The Legend of Zelda: Breath of the Wild is looking and sounding more enticing than any ever in a trio of new videos. While there isn't too much new information to glean from the roughly 8 minutes of footage that Nintendo uploaded for the game's refreshed website, there's a ton of smooth open-world gameplay to watch and more of that killer main theme. And now that we know we can play it all on the go or at home with Nintendo Switch, it's all the better. Here's the first Zelda video, titled "In This World". It focuses on exploration and the ways link can get around: climbing, swimming, hang gliding, and even snowboarding on his shield. And here's the second video, titled "In This Era". 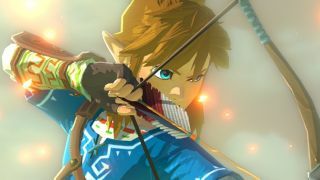 It shows more of Link's new approaches to dangerous encounters, including stealth, using the physics of the world to set off traps, and acrobatic archery. This third video shows a single shot of Hylian ruins as different weather patterns roll by. Link really ought to change out of his metal armor when he sees a storm coming.